NASCAR has a new daily fantasy sports partner in DraftKings that is sure to enhance the fan experience because of the free chance to win exclusive prizes and one-of-a-kind VIP experiences. Using a Salary Cap draft, the goal is to select the best fantasy team while keeping under the $50,000 limit. NASCAR Digital Media will grant DraftKings access to their direct data feed of real-time statistics. The Sports Techie community blog is grateful for the Q&A with DraftKings about the technology, business and social aspects of the premium content offering. The Coca-Cola 600 racing event this Memorial Day weekend at the Charlotte Motor Speedway features the DraftKings contest activating live on Sunday, May 24, 2015 at 6:00 pm EST. The sport of NASCAR is headquartered in Daytona Beach, Florida. It is extremely popular across the nation but especially here down in the South where the fans are loyal to their favorite drivers, racetracks and tailgate spots. With the influx of digital devices and other tech, connected to up-to-the-minute pre-race, live and post-race action and stats has never been easier for the hard-core, casual and new fan alike. Savvy NASCAR fans can now challenge thousands of other like-minded fans for the first time via the Official Daily Fantasy Game of NASCAR® thanks to their innovative partnership with DraftKings, based out of Boston. DraftKings is the daily fantasy sports website where users can compete against friends and rivals for cash prizes and earn the title of fantasy guru. In addition to daily fantasy auto racing, DraftKings also offers daily fantasy sports games in major professional and college sports. 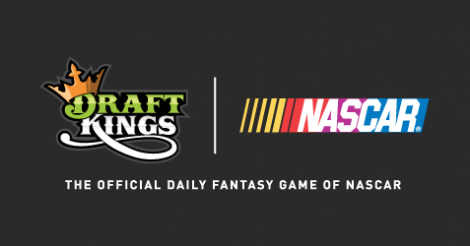 An added bonus is daily fantasy sports games and statistics are to be offered on DraftKings’ mobile applications, allowing NASCAR fans to enjoy the only on-the-go daily fantasy and content platform on the planet. DraftKings entered into a three-year agreement giving them an exclusive license to develop NASCAR-branded games across the daily fantasy sports category. The top two finishers win a VIP experience prize on June 7 in Pennsylvania. The winners prize include, VIP passes for the NASCAR fantasy expert winner and a guest, Grandstand tickets, airfare and hotel accommodations. The prize awarded is for the listed race only and may not be substituted for any other race nor is it redeemable for cash. Innovative Gameplay Will Give Fans the Opportunity to Win Exclusive Prizes. In each game, participants are assigned a fixed salary cap they can use to draft their entire roster, comprised of five NASCAR Sprint Cup SeriesTM drivers. Scoring categories in DraftKings NASCAR daily fantasy sports games will include finishing position, fastest laps, laps led, position differential and passing differential. DraftKings will offer two different types of NASCAR-themed games – a free game for casual players and paid games for avid followers of the sport. What are the expectations in terms of growing the fan base, increasing engagement and diversifying your audience? We are continually looking to expand DraftKings’ offering by pushing the envelope in daily fantasy sports, providing fans with a dynamic experience across a variety of sports that will better connect them to the athletes, teams and sports they love. Our latest partnership with NASCAR showcases that commitment. Other than finishing position, fastest laps, laps led, position differential and passing differential, what other measured stats can fans look forward to in the future? I recommend somehow adding Pit Crew time since it is a team race. These are the statistics currently used for our NASCAR game, but we are always looking to improve and optimize the quality of our games to provide a more dynamic user experience. As a NASCAR inGEAR Contributor, I am excited about the potential of the winning prizes and VIP experience. Can you expand on these prizes please for our International community? Prizes and VIP experiences specific to NASCAR range from VIP pace car rides, VIP access to driver’s meetings, garage tours and one of a kind experiences with the sport. Is there a million dollar pay out for both the free game for casual players and paid games for avid followers of the sport? If not, how will cash payouts be tiered? We offer a variety of contests at different price points. Our million dollar contests typically are part of paid entry tournaments where players qualify to enter the contest. Our awards are not based on a tiered system or set structure. Each contest is determined independently. No doubt the NASCAR Fan Experience will be enhanced with DraftKings. 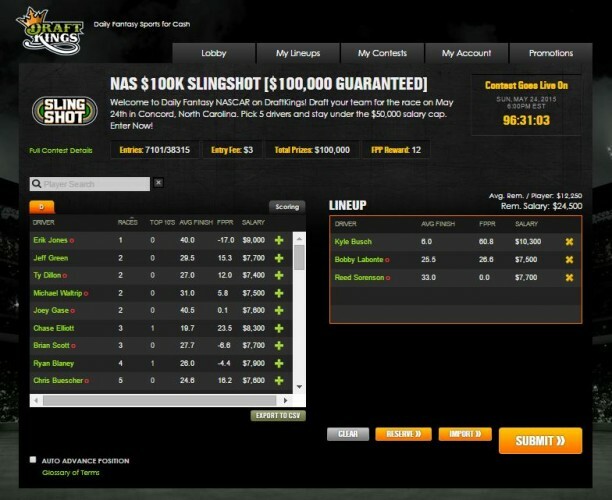 Do you expect racers to embrace the opportunity and be ambassadors for NASCAR Fantasy Sports? We look forward to exploring opportunities to partner with drivers and their teams in the future to further develop our NASCAR activation. Will NASCAR fantasy sports data and player rankings be part of broadcast content at NASCAR on FOX and NBC? How will weekday games differ from weekend games? 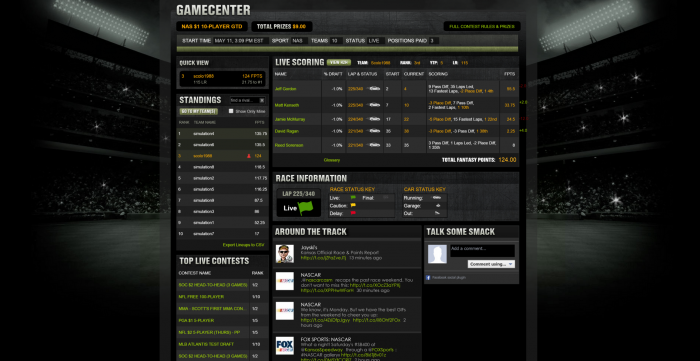 There are only weekend NASCAR games on DraftKings, as the races take place on weekends. The National Association for Stock Car Auto Racing, Inc. (NASCAR) is the sanctioning body for the No. 1 form of motorsports in the United States. NASCAR consists of three national series (the NASCAR Sprint Cup Series™, NASCAR XFINITY Series™, and NASCAR Camping World Truck Series™), four regional series, one local grassroots series and three international series. The International Motor Sports Association™ (IMSA®) governs the TUDOR United SportsCar Championship™, the premier U.S. sports car series. Based in Daytona Beach, Fla., with offices in eight cities across North America, NASCAR sanctions more than 1,200 races in more than 30 U.S. states, Canada, Mexico and Europe. For more information visit http://www.NASCAR.com and http://www.IMSA.com, and follow NASCAR at facebook.com/NASCAR and Twitter: @NASCAR. Launched in April 2012, Boston-based DraftKings, Inc. is a leading online gaming destination where players engage in daily fantasy sports competitions across fantasy professional baseball, football, golf, basketball, hockey, soccer, and mixed martial arts, and college football and basketball. 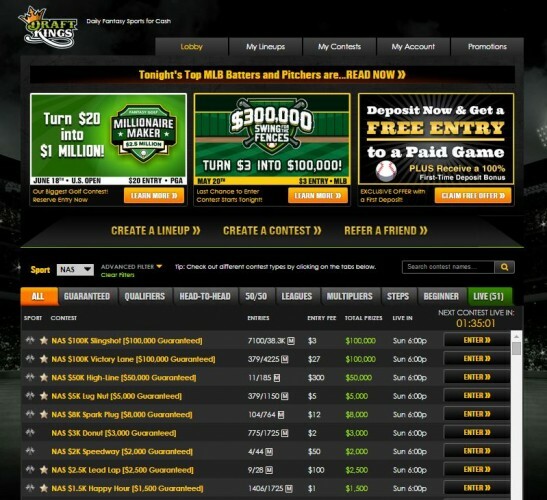 DraftKings offers free and pay contests every day that award cash prizes. All wars feature a salary cap format, and new contests are offered every day with instantaneous prize distribution for winners. For more information, visit DraftKings at www.draftkings.com, like DraftKings at facebook.com/draftkings and follow on twitter.com/draftkings. 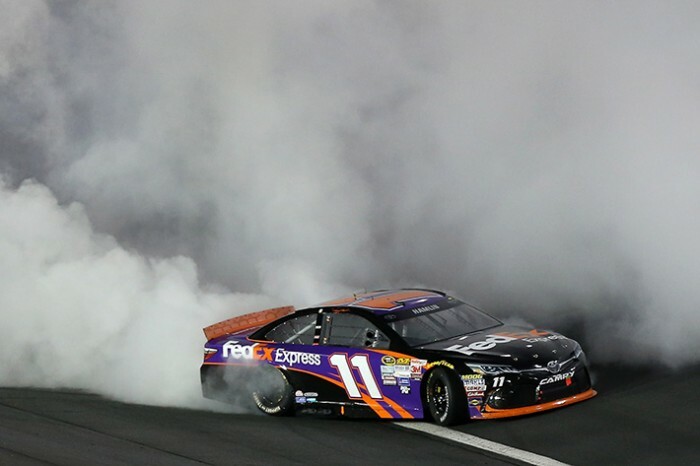 Sports Techie, NASCAR on Fox is your TV provider for the Coca-Cola 600 Sprint Cup event and there is time to enter the official fantasy game of NASCAR, here. To give you a competitive edge, I have provided the Bing predictions contrived from data provided by STATS, for the top five drivers: Kevin Harvick, Joey Logano, Kurt Busch, Jimmie Johnson (last year’s winner) and social media kingpin, Brad Keselowski. Use at your own discretion. At this time, over 2,500 fans have signed up for the official daily fantasy game of NASCAR so the odds of winning are extremely good. The total cash prize so far is $6,600. I enjoyed being a NASCAR inGEAR contributor last season. It gave me a behind the scenes look at content produced by NASCAR, industry writers and fellow bloggers as well as providing me valuable insight to the sport I have grown to enjoy a lot more since moving to Georgia last year. Earlier this week, we featured the DraftKings sponsorship partnership with The Basketball Tournament (TBT) readable at this link, here. Personally, I love fantasy sports and have been a player for over three decades.